It’s just after dark on the fourth. Do you know where your dog is? 1. Follow the leader. Your dog watches you closely every day and night. Carry on as usual when the fireworks start, and your dog may do the same. Try not to make the mistake of comforting a scared dog. You can reinforce her skittish behavior and jumpstart a pattern of being frightened of many things. 2. Roll over, Beethoven! Classical or other types of soothing music can truly calm your pet. Turn your music up a little to mask the fireworks’ snapping and popping. 3. Tired dogs don’t jump. July 4th is a great day for exercise and lots of it. Wear your dog out with an extra long walk or a little longer time playing fetch. By the time the sun goes down, your dog may be more focused on settling down to sleep than on jumping up to hide. 4. And the thunder rolled. With the premise that thunder and loud noises in general can start a less than desired behavior in your pet, the Thundershirt has been introduced as an affordable solution. The idea of gentle constant pressure is similar to that of swaddling a cranky human baby – and it works for 80% of the pets that try it. 5. Zen around the collar. Nothing’s happier than a fed, warm puppy. That’s the idea behind AdaptilTM products; you can choose a spray, diffuser or collar to distribute a synthetic copy of pheromones or mama dog hormones meant to soothe nursing puppies, the hormones released by a lactating mama dog for her puppies. Works well for adult dogs as well as puppies. Click here for more information about AdaptilTM. 6. Lend me your ears. Your dog’s ears are much more sensitive than yours. Many dogs benefit from wearing specially designed Mutt Muffs that can block some levels of the noise. 7. Don’t be a pill. When you’ve tried a host of ideas and your pet’s still a quivering bundle of nerves, talk to your vet about anti-anxiety medications and your dog’s usual patterns. A fast- acting variety might be the perfect solution for one rowdy summer night. 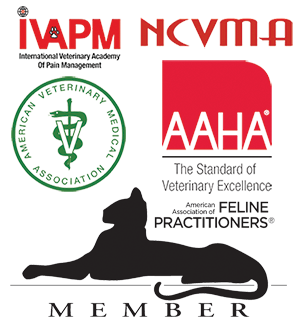 Give us a call if would like to discuss your dog’s case with us. 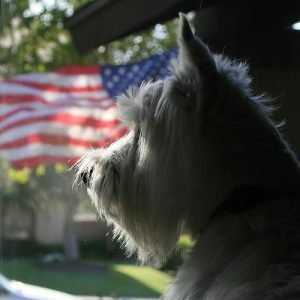 Three cheers for the red, white and blue – and a calm, stress-free dog! And both of you have a safe, happy fourth! Whether travel inspires you to sing On the Road Again or Leaving on a Jet Plane, initiating travel with your pet can be an excellent adventure for all concerned. If you would like your next trip to include your pet, take a look at these 9 tips to ease the way. 1. Day Tripper. Start small with local jaunts. When your pet likes outings in the car to a local park or trail, your family’s ready for the next adventure. 2. Carry on, Dude. Consider carriers a little piece of home for your pet wherever you roam. Special snuggly toys or blankies may be optional but can be very much appreciated. 3. Do you know where you’re going to? Does your destination hotel or campground welcome pets? Get the details before you go with these resources for hotels and for camp grounds, parks and beaches. 4. Got a ticket to ride? Thoughtful preparations can make travel by plane, train or car feel familiar for your pet. A leash, special food, daily meds and a small first aid kid can help your pet handle the differences that each type of travel brings. 5. Going to Carolina in my mind. A microchip can help ensure your pet’s returned to you should she wander away in a new environment. This simple step can give you peace of mind before you go. Give us a call to set up an appointment. 6. Love that pink Cadillac. 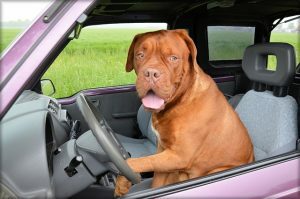 Play the radio, roll down the windows or enjoy the crushed velvet seats – but don’t leave your pet in any parked car. Even with the windows down, temperatures rise quickly, and your pet could be endangered by heat very quickly. 7. Under pressure? If your pet gets stressed over travel, AdaptilTM, available at Town N Country, can help. AdaptilTM collars and diffusers encourage diffusion of pheromones, hormones released by lactating mammals to comfort and soothe. 8. Eat, drink and be merry. Some pets may suffer with tummy troubles when they travel, but a few precautions may help you avoid such a scenario. Give only bottled water when you’re on the go since differences in tap water can upset your pet’s digestive system. Never feed an animal in a moving vehicle, and try to time a light feeding 3-4 hours prior to departure. 9. For the Record. More than likely, you won’t need it, but taking a copy of your pet’s immunization record is a prudent idea. Give us a call, and let us help you. 10. Doggie Daycare and Kitty Condo. Maybe your short jaunts or your experience with your pet’s car sickness has made you decide you do not want a traveling companion. Bring your fur babies to us for their own vacation! We’d love to have extended quality time with your pet, while you enjoy your time away. So, pack your bags – and all of Farley’s gear, program your GPS and be off! Whether you decide to travel with or without your pet, have a great vacation, and a safe trip back from the wild blue yonder. Dogs and cats are notorious for having upset stomachs. They retch and hack and throw up, and if you follow them around, it’s no wonder! The stuff they eat and lick and sniff probably makes your stomach churn. Their stomachs react to every little emotional upset or environmental change. And things are worse when they have a virus, are on antibiotics, are getting vaccines, or are getting older. We humans often use probiotics to promote intestinal health. And now there is a product that will do the same for your pet! FortiFlora is a probiotic supplement for dogs and for cats. It has live active cultures, and high levels of Vitamins A, E, and C. Believe it or not, most pets think it tastes great. FortiFlora puts good bacteria into your pet’s body, the kind of bacteria that helps fight disease and make the whole digestive system work smoothly. It comes in little packets that you sprinkle onto your pet’s food, so administering it is a breeze. Patients have been very enthusiastic about the results! If your pet has diarrhea, soft stools, gas, or other intestinal woes, talk to us about FortiFlora. Fortiflora could be the answer to their GI problems. You have done so much for us and gratitude to its fullest is hard to express.